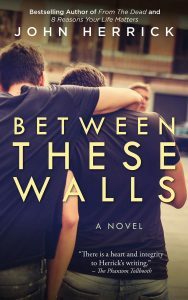 Earlier this week, I woke up to a beautiful new review of Between These Walls, one of my earlier titles. A shout-out and much gratitude to Kerstin at Whispering Stories. If you enjoyed the novel or film Call Me By Your Name, this one might interest you, too. For those who have never read Between These Walls, it holds a personal spot for me. I believe it’s my strongest output in terms of character development, a real psychological dig. It captures a protagonist at the crossroads of faith and sexual preference. At the time I wrote it, I had no idea it would hit shelves around the time gay marriage would become a pressing topic around the U.S. More details on this at johnherrick.net/betweenthesewalls. You can find the book at Amazon or other retailers. THANK YOU to everybody who invests part of their lives in my stories.